Adichunchanagiri also called Sri Adichunchanagiri Maha Samsthana Matt, is a religious mutt. Sri Kalabhairaveshwara is the Kshetra Palaka of Sri Adichunchanagiri Mahasamsthana Math. Lord Gangadhareshwara is the presiding deity. The Pancha Lingas, the Jwala Peetha, Sthambamba are all held in great reverence by the devotees. 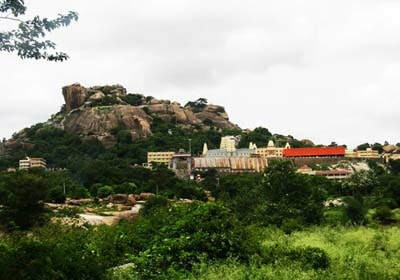 The peak point of the Giri (hillock) is known as Akasha Bhairava and the sacred pond by the temple is Bindu Sarovara. Recently two attractive lakes have been built for the Theppothsava programmes. The old Bindu Sarovara is also renovated recently as per agama tradition. It is situated on a rocky hill at an altitude of about 3,300 ft. above sea level. 6 km from Bangalore-Mangalore NH 48. The approach to the hill is from the west and the pilgrim who looks up the hill while visiting, it finds the hill itself to be in the form of Athmalingam found in the Gokarna Kshetra. At the time of moonrise the hill appears like the moon crested Shiva, i.e, Chandramouleswara. This abode of green woods and small lakes enlivened by wild peacocks and birds has been attracting sages and rishis since ancient times. 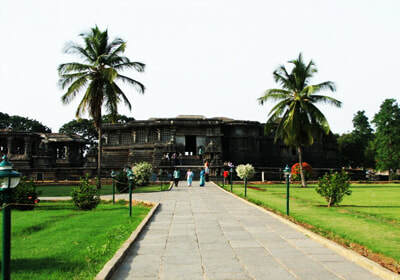 Belavadi is a village which is 12 km from Halebidu. The place is described as Ekachakranagara of Mahabharata and the village is known for Veeranarayana temple of Hoysala architecture. A Festival called Bandi-Bana is celebrated annually by villagers in memory of Bhima slaying Bakasura. There is a big tank ascribed to one Dhanakaraya, a local chief in whose honor a temple has also been constructed on the bank. It was originally a Jaina centre. later Krishnaraja Wadiyar II gave this village as a grant to the Sringeri Matha. There is a Ganapati temple and the main deity is variously known as Huttada (ant hill) Ganapati, Udhbhava Ganapati and Varada (boon) Ganapati.This temple is being maintained by sringeri matt and also a free high is run by the matt where free mid-day meal is given to students. Near this temple there is another temple of Shankareshwara. The ruined temple of Basaveshwara has been reconstructed recently. Well known hoysala temple in trikutachala form is at that village centre. Main presiding deity is veeranaryana along with yoga narasimha and kolalu goopala.This kolalu goopala is a beautiful statue in India according to archaeological dept of India. On the day of makara sankranti every year sun light directly enters the sanctum sanatorium of Veeranarayana temple. The other temples of Belavadi are Veeranarayana, Beeredevru, Kariyamma and Bindigamma. The Veeranarayana temple is one of the largest Hoysala monuments. Shravanabelagola is located near Channarayapatna. 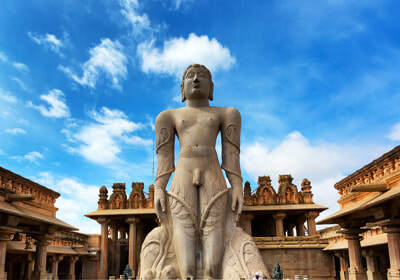 The statue of Gommateshvara Bahubali at Śravaṇa Beḷgoḷa is one of the most important tirthas (pilgrimage destinations) in Jainism, one that reached a peak in architectural and sculptural activity under the patronage of Western Ganga dynasty of Talakad. Chandragupta Maurya is said to have died here in 298 BCE after he became a Jain monk and assumed an ascetic life style. It is situated at a distance of 12 km to the south from the Bangalore-Mangalore road (NH-48). The 58-feet tall monolithic statue of Gommateshvara is located on Vindyagiri Hill. It is considered to be the world's largest monolithic stone statue. Halebeedu (Kannada: ಹಳೆಬೀಡು, literally "old city" Halebidu was the 12th-13th century capital of the Hoysala empire. The Hoysaleswara temple was built during this time by Ketamala (around 1121 AD) and attributed to King Vishnuvardhana, the Hoysala ruler. It is believed to have been completed around 1160 AD by Kedaroja, the chief architect of Vishnuvardhana's son and Successor Narasimha I (1142 - 1173). It enshrines Hoysaleswara and Shantaleswara, named after King Vishnuvardhana Hoysala and his Queen Shantala Devi. The city which was originally called Dorasamudra, got the name "Halebeedu" because it was ransacked two times during the invasion of Malik Kafur. Belur was the early capital of the Hoysala Empire. This is one of the major tourist destinations in Karnataka. Belur is located in Hassan district. According to inscriptions discovered here, it was also referred to as Velapuri. 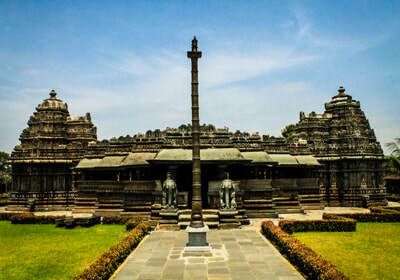 The main attraction in Belur is the Chennakeshava temple complex which contains the Chennakesava Temple (dedicated to Chennakeshava, meaning handsome Vishnu) as the centerpiece, surrounded by the Kappe Chennigraya temple built by Shantaladevi, queen of king Vishnuvardhana. 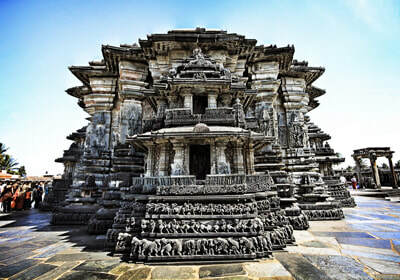 The temple is one of the finest examples of Hoysala architecture. It was built by king Vishnuvardhana in commemoration of his victory over the Cholas at Talakad in 1117 CE. Legend has it that it took 103 years to complete and Vishnuvardhana's grandson Veera Ballala II completed the task. The facade of the temple is filled with intricate sculptures and friezes with no portion left blank. The intricate workmanship includes elephants, lions, horses, episodes from the Indian mythological epics, and sensuous dancers (Shilabalikas). Inside the temple are a number of ornate pillars. Darpana Sundari (Lady with the mirror) carved on walls of Belur Temple is one of major attractions in the complex.